As shocking plot twists go, Jared being the one who murdered his parents and his sister may rank as one of the most shocking plot twists ever. I didn’t even begin to suspect him until about ten minutes before the big reveal. But here’s the thing about big, shocking reveals—they can’t just shock for shock’s sake. It’s got to hold together. And the Jared reveal really did. Everything suddenly made sense—why Jared was swimming when his family was massacred, why Kate was meeting with him without disguise, and why he was so good at lying. Jared tries to redeem himself by protecting Philip and Elizabeth and shooting Larrick. “You have to tell the Centre that I saved you,” he implores. And poor, misguided Jared thinks he had to kill his family to protect his cover. “What we do is for something greater than ourselves,” he tells Philip and Elizabeth as they see how the psychology of the KGB plays out on an impressionable, adolescent mind. The look of horrified realization on Keri Russell’s face was perfect. Larrick, for all his nefarious activity this season, wasn’t going to kill Philip and Elizabeth. He was going to turn them in. Or at least that’s what he claimed his plan was. You definitely got the feeling he would have left Philip and Elizabeth alone if they hadn’t killed his friends at the Contra training camp. Fan favorite Claudia was back telling Philip and Elizabeth that the Centre was targeting second generation illegals to join their ranks. Having been born in America, the second generation illegals would be able to work for the CIA or the FBI and gain the kind of access Philip and Elizabeth never would be able to have. When Emmett and Leanne refused to let Jared participate, Kate was sent in to seduce him and convince him to join the cause. What hormonal teenage boy wouldn’t be swayed by a beautiful older woman? Claudia tells Philip and Elizabeth that the Centre wants Paige to be next. “She belongs to the cause and to the world. We all do,” she tells them. A livid Philip meets with Arkady. “If your organization ever gets anywhere near our daughter without our permission, my wife and I are finished,” Philip tells him. But back at home, Elizabeth is thinking that maybe it wouldn’t be such a bad idea for Paige to follow in her parents’ footsteps. “She’s looking for something in her life. What if this is it?” Elizabeth wonders. What we do know is that Paige probably can’t be fooled for much longer. When her parents whisk her and Henry off to some motel in the name of spontaneous vacation, Paige isn’t having any of it. “I’m counting the days until I can get out of this lunatic asylum,” she tells her brother. Let’s pause for a moment to revel in Noah Emmerich’s fantastic performance as Stan. Right up until the moment Arkady hands Nina the note that says, “Tell Nina I’m sorry,” I thought Stan could go either way. I mean he went as far as smuggling the Echo technology out of a secure location. But in the end, he can’t betray his country—not even for the woman he loves. It was heartbreaking to see Nina looking back at Oleg as she leaves the Centre, and then at Stan as he watches her drive away. Both men loved her but neither could save her. I believe this may be the last we see of Nina. She’s being sent back to the Soviet Union and tried for treason. I don’t see that ending well. Annet Mahendru was glorious as Nina. I’m sure we’ll be seeing her again very soon. And poor Fred Timbrook. He wore the shoes to get the paint dust samples but was caught by security and shot. He died, but not before getting the shoes to the agreed-upon drop off location. Fred just wanted to be important to the cause and in the end he was. “Someone sacrificed himself today,” Philip tells Elizabeth. In the final shot, the Jennings family sits down for an American meal of chicken and potatoes. A good finale offers a satisfying conclusion while laying the groundwork for the next season. 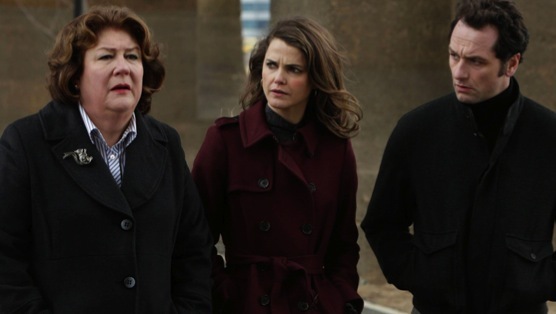 The stunningly perfect season finale of The Americans did exactly that. Paige is in play. Philip and Elizabeth are at odds about Paige’s future. The FBI knows about Emmett and Leanne. I can’t wait for season three. •Nice touch having Vlad come back in Stan’s nightmares. •We didn’t see a lot of Martha tonight but she lived through the second season. Something I never would have predicted. What did you think of tonight’s season finale of The Americans? Were you shocked by the Jared reveal? Talk about it below. Amy Amatangelo is a Boston-based freelance writer, a member of the Television Critics Association, and a regular contributor to Paste. You can follow her on Twitter or her blog.